Quartz vs Granite. Which should you choose for the ultimate kitchen remodel? Truth be told, both are really the ultimate choice and in the end it simply comes down to personal preference. Like all options on the table, there are pros and cons, though most of the cons in either Quartz or Granite are minor. Quartz is a crystal, and a very hard one. On the Mohs Scale of Relative Mineral Hardness (a scale designed by German mineralogist Freidrich Mohs to compare the hardness of minerals) Quartz is at the top in terms of durability of all the materials used in home construction. Quartz is also non-porous, all but eliminating bacterial buildup and stains. Besides its durability, Quartz comes in a great variety of colors beautifully accented by its finish, with waves of highlights reminiscent of the inside of an ocean-polished seashell. From chocolate to pearl, forest moss to desert sands, cerulean skies and sea foamed waters, the colors are vibrant and pure in their depth. Quartz stands out for its uniformity in color and pattern, with less variation than Granite offers, providing a consistent look across the piece. As Quartz is an engineered stone, having less than ten percent of its composition containing resin and pigments, sealing is not required and therefore regular re-sealing a non-issue. Overall, considering the color options, the sophisticated beauty, the durability, and the low-maintenance, the cost savings are very much to be desired when compared to Granite. Granite is as close to raw nature in your home as you can get. Granite is not manufactured. In fact, Granite comes as a huge slab of stone which is then cut down to an exact shape any customer would choose. Once cut, Granite retains all the subtleties in color and depth of texture from its formation and comes in an incredible variety of colors. Any color you can imagine, and no two colors or patterns will ever be the same. The granularity of Granite is what’s so unique about this stone; retaining the sense that this slab was ground out of a mountainside and took all the personality with it. Granite is a porous rock, and as such should be sealed, giving Granite the same antibacterial and stain resistant properties as engineered Quartz. Hardness and scratch resistance are comparable to that of Quartz. While sealed Granite is incredibly easy to keep clean – a damp cloth and some water – it is recommended to re-seal once every two years to maintain its integrity. Granite is elegant and earthy, with an aura of luxury and one-of-a-kind patterns that are very stylish and classy. Should I Choose Granite or Quartz? Whether you are providing a beautiful, strong, scratch-resistant, long-lasting, easy-cleaning surface for your kitchen, bathroom, dining room, bar top, fireplace surround, back-splash, or shower, either Quartz or Granite should be your first and only options. Both offer significant longevity, stunning appearance, and value to your home. Quartz is a great option for those on a budget who would like to put some money elsewhere, or maybe renovate all the rooms of the house with Quartz. Granite is timeless and elegant with a each cut is unique; perfect for showing off in areas where family and friends congregate in the home. 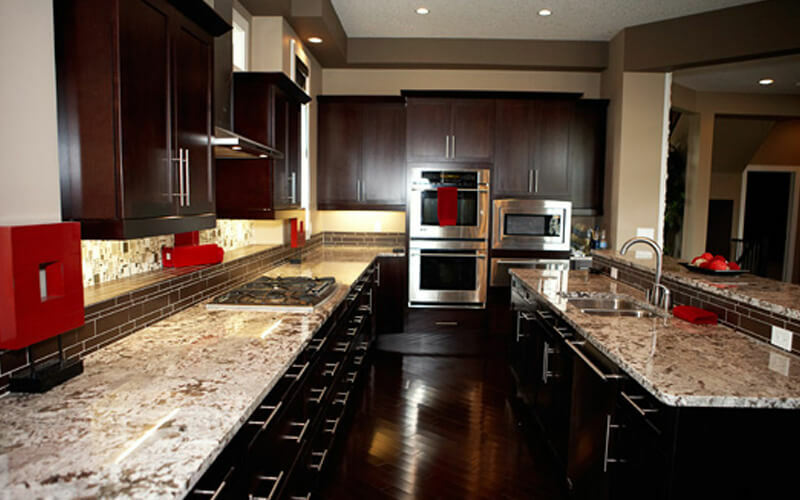 My best suggestion to you is to head down to K&J’s Custom Granite, a trusted Edmonton Quartz and Granite supplier, to touch, feel, and look at all the options yourself where we are sure you will find, out of hundreds of one-of-a-kind options, the right choice for you and your home.